In December of 2018, the finalized version of the 2018 Farm Bill, or Agriculture Improvement Act of 2018, was confirmed by Congress. Aside from addressing agriculture and nutritional policies, what makes this bill interesting is the inclusion of new laws regarding the cannabis plant. Specifically, the bill discusses hemp, which is the cannabis plant but containing no more than 0.3% of Tetrahydrocannabinols (THC). Through previous decades, federal law did not differentiate hemp from other cannabis plants. Recently, the hemp plant and the Farm Bill have received increased attention because Senator Mitch McConnell was an important supporter for the removal of hemp from the federal list of illegal drugs. The definition of hemp has also been expanded in the 2018 Farm Bill, with one change being the inclusion of cannabinoids (CBD), certain chemical compounds found in the plant. The Farm Bill states that any cannabinoid from hemp will be legal only if the hemp is produced by a licensed grower, following regulations outlined by the Farm Bill. Cannabinoids are the base of several products. CBD oil, the non-intoxicating extract, has started to be employed in treating various medical problems. CBD water, which is infused with cannabinoid molecules, is now commercially available. 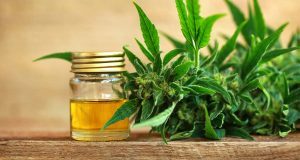 Also becoming more popular is hemp oil, which is rich in omega-6 and omega-3 polyunsaturated fatty acids and vitamin E. Alongside the oil, hemp water is readily available to consumers. The market for these products is growing, as the benefits of the products are still being explored.